Smoked sausage often is used as a meat entree, but you can use it as an appetizer or add it to pasta and soups. The terms smoked sausage and kielbasa are used interchangeably by many people, but they are not necessarily the same. 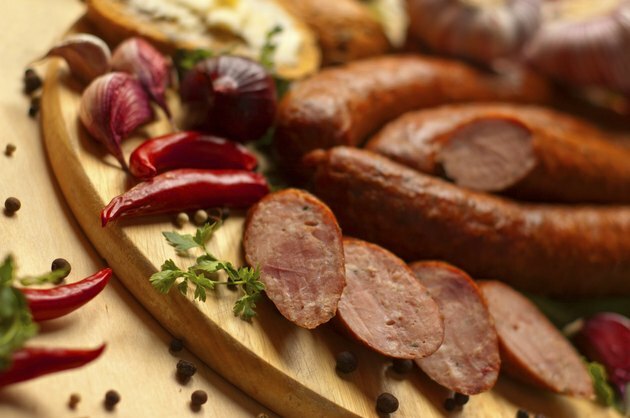 Smoked sausages may be fully cooked or uncooked, while kielbasa refers to cooked sausages. Hillshire Farm sells several smoked sausage products made from beef, pork, turkey and chicken. They also sell skinless smoked sausage, varieties flavored with cheese and an Italian-style smoked sausage. Preparation is the same for all except the skinless smoked sausages. Pour enough water into a pan to reach a depth of 2 to 3 inches or to completely cover the amount of smoked sausage you're cooking. Place the pan on a stove burner, turn it on high and bring the water to a boil. Remove the sausage from the plastic packaging and place it into the boiling water. Cover the pan, reduce the heat to medium and simmer the smoked sausage for 10 to 12 minutes. Remove the smoked sausage from the plastic packaging. Wrap the sausage in paper towels. Place the smoked sausage on a microwave-safe dish. Set your microwave on its high setting and cook the sausage for 40 seconds to 45 seconds. Let the smoked sausage stand for about one minute before removing it from the microwave. Brush the hot grill with a grill brush to remove any food residue. This helps keep the sausage from sticking to the grill and also prevents contamination from foods that were previously grilled. Remove the sausage from the plastic packaging and set the meat on the hot grill. Allow the sausage to cook for 12 to 14 minutes, turning it frequently so it browns evenly on all sides. Remove the sausage from the package and cut it in half length-wise or into 1/2 inch pieces. Put the smoked sausage into the skillet and cook for 6 to 9 minutes, turning frequently. Remove the skinless smoked sausages from the package and put them into a shallow baking pan. Put the pan in the oven and bake for 15 to 20 minutes. Remove the smoked sausage from the oven and let it stand for 3 minutes before serving. Once cooked, you can brown smoked sausage by placing it in a hot skillet and turning it frequently with kitchen tongs until it reaches your desired color, Hillshire Farm recommends. Unless your recipe specifies otherwise, cut the smoked sausage into pieces the size you need before cooking it. Remember, though, that pieces cut too small may fall between the grill racks. Heat your smoked sausages thoroughly. Uncooked pork sausage should be cooked to an internal temperature of 145 degrees Fahrenheit, beef to 160 degrees Fahrenheit and turkey or chicken to 165 degrees Fahrenheit to ensure bacteria are killed. After the appropriate temperature is reached, let the sausage rest for 3 minutes before serving.